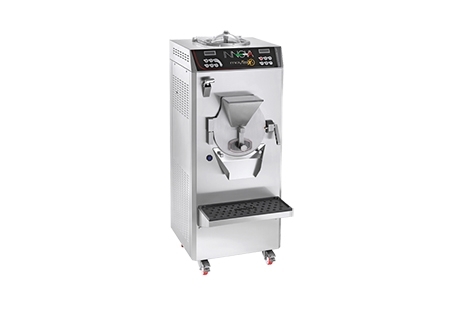 Movìmix is a multifunction machine that can be used to customize each flavour of ice-cream as required and regulate the quantity produced. The Movìmix heats the mix in the upper cylinder and simultaneously cools it in the lower one. The cylinder locking system and the stirrer are patented by Innova to guarantee absolute hygiene inside the two chambers, a perfect blend and complete extraction of the ice-cream at the end of each cycle. Versatile programming gives a soft, creamy and spatula-friendly ice-cream, ready for chilling or immediate display. Superior quality components, efficient operation and state-of-the-art technology are the main features of Innova’s multifunction machine.